Oh so many years ago, when we first arrived in Costa Rica, God opened up an opportunity for us to lead a bible study in our neighborhood. This particular bible study was unique to anything we had ever experienced before, and has proven to be something that was definitely God designed, God led, and blessed by God. An expat family in our neighborhood who we had become close with asked us if we would meet with them each week to help them to understand the Bible for themselves … a great opportunity handed to us by the Lord! Of course, we were thrilled to do it, yet had no idea what God would do through what He had laid out before us. This particular expat family had several rental properties, and were always in the middle of a project of some sort. The great part about what they were doing was that they were able to employ many locals in our neighborhood who were in desperate need of work. 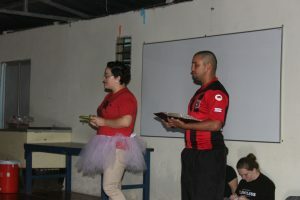 In their excitement about the bible study and their personal eagerness to dig in to God’s Word for themselves, they would joyfully invite each of the Costa Rican workers to the Bible Study each week. Keep in mind that the Bible Study was in English, because the family was a family of native English speakers. The workers began faithfully coming to the bible study, some bringing their entire family (brothers, sisters, children – the works) each time we met. It was incredible watching them faithfully come week after week, allowing us to get to know the heartbeat of where God had placed us. Little did we realize at the time that the workers were coming because they thought that attending the bible study was a condition of their employment!!! At the beginning of our meeting together, we were grateful that God had also provided one man who was bilingual. We were still in the beginning phases of learning Spanish well, so this was a great benefit to us – it’s not easy to teach and or translate the bible into a language that is not your own, especially when you don’t have a strong handle on the language and biblical terms yet! This young gentleman was happy to help us out and led the Spanish speaking table during our time together the first few months. So there we were … new to the neighborhood, filling up two large tables each week – one with English speakers, and one with our Spanish speaking neighbors – studying the Word of God in more than one language. It was a beautiful thing to be a part of. As time went on, and our language skills improved, we were able to begin leading the Spanish speaking table as well. This is when we saw God begin to do some amazing things. One Costa Rican man in particular came faithfully each week. Bringing his wife and 2 little boys, they would sit at our Spanish table and would listen to the teaching – all while we got to know them, sure to listen to the Holy Spirit for guidance. It became obvious that he was there because of the employment, and when he would share, that his wife had no great amount of respect for him or in what he was saying – she gave off the vibe like everything coming out of his mouth was all just for show. As the weeks went on, we got to know them more on a personal level, and began discipling them more individually. Week after week, you could see the Holy Spirit doing a work in each one of the family members, particularly in the man. When the Holy Spirit was working, his speech would be as honey as he shared what he was learning, or what a verse meant to him – it was as if you could physically see the transformation occurring week after week. With time, the softness and openness began being obvious in the woman as well. God was doing something mighty through the study of His Word, and the privilege of sitting with them, teaching them, praying with them and having them become like family to us left us awestruck at God and His plan for each one of us. Soon we were trusted by even their extended families, and they began sharing their past – what stories they had to tell! The most beautiful part of it all was that as they were being transformed by the love of Christ, they were being watched by the entire neighborhood. No one understood what was happening, and how this man could be living like he was now – the complete opposite of who he used to be! The couple got married, began leading their friends and families at a bible study in their own home during a different time of each week, while continuing to meet for discipleship with our family. The day that they asked to be baptized is a day we will never forget. We joined together down at a river near our house, and witnessed their public declaration to their commitment to Jesus Christ – they have never turned back! The Lord even used a ministry event that we were hosting to provide a way for the young man to preach for the first time – what a day that was! Over the years we have met with them and other believers in Christ in our neighborhood at a Spanish speaking Christian church, and eventually they became elders and leaders in that little congregation. 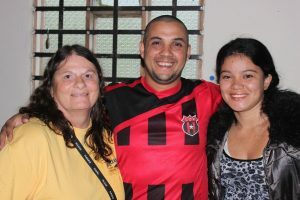 Moving on to a larger congregation closer to town which provided them an opportunity for more growth, he began studying as he had felt the call to be a pastor. Since then, their faith has grown, many in their extended families have accepted Jesus Christ as their Lord and Savior, and they are a force for the Lord! Just this last week, we got a phone call from this family to let us know that they had been offered a position as pastors to start up a new congregation in another area near us. Imagine our joy as we were told this news – the flashes of all of those years ago when they came to study God’s Word with us out of ‘obligation’, and how God used that for His will in their lives and His glory! There have been many great things that God has done in our lives, but the honor of being allowed to know this family and watch God’s mighty hand in their lives and the lives of others they are touching is indescribable. Never underestimate the plan that God has with even the smallest of things in your life. Remain open to everything He asks you to do, especially the things you have no qualification for by the world’s standards! 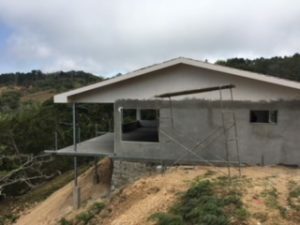 Please consider partnering with us as we continue to work with and support the work that God is doing through this new congregation and the church they are building for the people of San Ramon, Costa Rica. God has been moving and working in so many ways, both seen and unseen, during the first quarter of 2018. He continues to amaze us with His plan and His creativity, proving time and time again that nothing that we have gone through or put effort into is in vain! We are so excited to say that even as we continue with what is going on in Costa Rica, He has made a way through all of the hurdles of paperwork and legalities to also open doors into Panama. To see what He is doing with things that He started almost 8 years ago in Costa Rica continue and to begin to overflow to Panama is nothing short of miraculous. 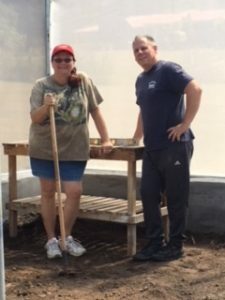 This quarter’s Work Discipleship Project has brought two new men to the construction project and we are grateful for what they bring to the job. The process is moving along at a brisk pace, and we are confident in God’s provision not only for them and their families, but for ours as well. Continuing to bridge the gap between language and culture, every day brings new opportunities to share the love of Christ even as we work along side of them with everything from purchasing and delivering supplies to painting and designing a beautiful home! Really never imagining the doors that teaching English would open, classes continue with both children and adults. The ability of God to weave conversation and questions into an English lesson never ceases to amaze – the opportunities to share the Gospel, have open discussion and answer questions, and teach the Word of God all in the name of teaching English is something we are humbled to be a part of. It also remains one of the best ways for us to continue to improve in our Spanish skills as we see more and more how much Costa Rica and Panama are and as far as we can see in the near future, to remain our home! Friends have made the trip to Panama from Costa Rica with us and interest in joining us keeps on growing – that’s always encouraging! Although the countries are similar in many ways, their differences are just as obvious. 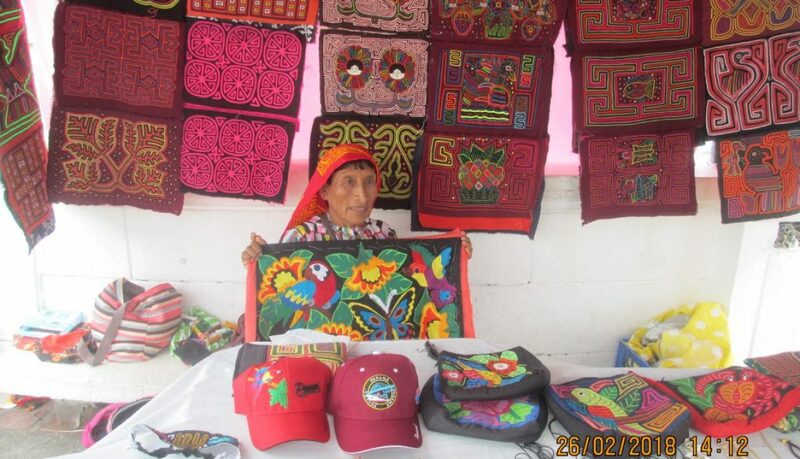 With the location of the farm location being so tied in with the surrounding families from the indigenous tribes, there are continually growing opportunities to serve in many different ways. One very exciting addition is the work that a friend has done to get audio files of the Bible not only in Spanish, but also in the native Ngobe tribe language. We look forward to multiplying that resource and working with him to help spread the word of God to all peoples. Finalization of paperwork for ease of movement in, out and around Panama. Working to help complete the Structure of the first 48′ x 60′ greenhouse. 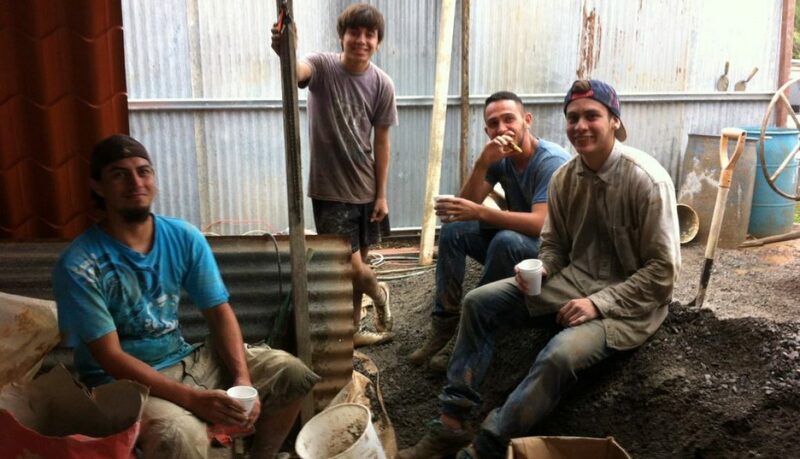 Ministry volunteers using the bunkhouse as their home base during their time serving in Panama. 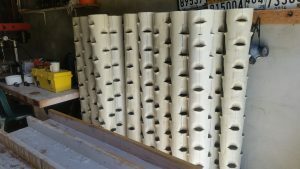 Completion of hydroponic test towers. Feeding of families and sharing each day’s egg collection from the ever growing chicken house! 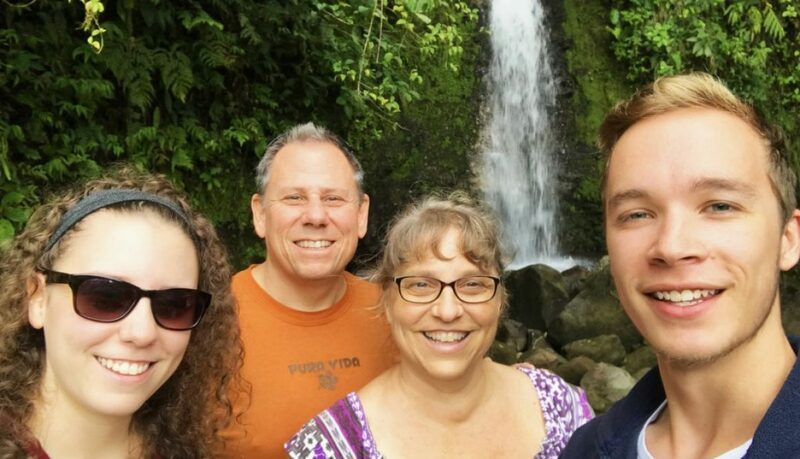 Connecting with others ministering in Panama to help them further their calling. Each moment that we take to reflect on what He has done, where He has brought us and how He never leaves us nor forsakes us, we see His greatness and His majesty. That makes it easier to see that even the hardest of times and longest of valleys are all for His glory. We are entering into this next quarter of 2018 encouraged, refreshed (even within the ‘busy-ness’), and hopeful of what is to come. Our heart is for God to move in and through us in whatever way He sees fit while we keep our eyes on the prize set before us and run the race with all we’ve got. We would love to have you be a part of ministering with us! For more information on how you can help or participate, please be sure to contact us! There is nothing more rewarding than to have an impact on a young person’s life and their walk with Jesus, and to watch them continue on in their life growing and moving forward with what God has taught them! Staying connected from afar is possible, but it’s so much sweeter when we get to all be together again and really spend time together, catching up and sharing all that God has been doing. We had the wonderful opportunity to spend two weeks with one of our interns, Landon Bourland, just recently when he met up with us in Panama. 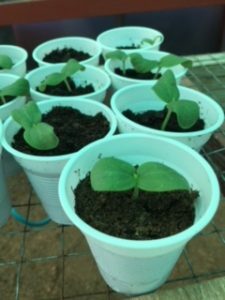 We were in Panama to work with our partners there while they are working on securing water by researching greenhouse construction and production for the next phase of agricultural growth there. It was so great to see him and to make plans for our next time together – God has great things in store for what’s going on in Panama and in Landon’s life as well! Several years ago we were assisting a short term missions team that was here for a week to minister to some of the neighborhoods in the San Ramon area. The team was playing games, working on crafts and teaching a bible class each day to the younger school age children in that particular neighborhood. In the background stood several teenage boys who were too old to appreciate what was going on, but they were never-the-less curious. One of the leaders of the group noticed them and had a desire to get to know the boys more. That’s when he approached us to ask for help in going and speaking to the young men. After a little bit of getting to know each other, he asked the young men one question: “What do you guys need?”. To his amazement, as well as ours, they all said without hesitation, “jobs”. 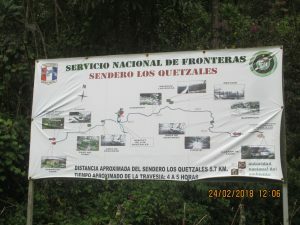 It was at that point that we knew God was leading us in our ‘tent-maker‘ role to use what we were familiar with doing prior to our arrival in Costa Rica, remodeling and building homes, to move forward in earning our way yet also providing for those in need of jobs while training them up in the ways of the Lord at the same time. Just as Aquila and Priscilla were willing to invest the time necessary to take one young man under their spiritual care and pour into his life the things of Christ, we strive to do the same thing with our Work Discipleship Program. Working side by side with young men to train them to be tent-makers, our goal is to teach them the truth of God as we labor together making it a part of both our life and ministry. And as a result of this time, just as with Aquila and Priscilla, our prayer is that each laborer may become an effective servant of God (1 Cor. 1:12). If you would like to help support the salary of someone in the work-discipleship program, please click below to donate. What do you think? 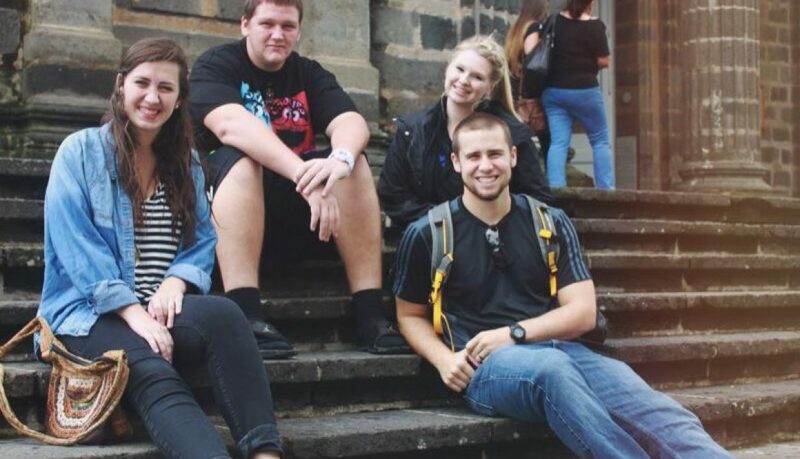 Is Costa Rica ready for a Dance Discipleship Program? Discipleship is at the heart of Relentless Ministries. The hunger that we have seen by those we are surrounded with to know God and understand scriptures for themselves is an exciting thing. Many are amazed to learn and experience that you can read the bible for yourself, understand what it says and means, and can experience the Holy Spirit opening their hearts, eyes, and minds in a way that they never knew was possible! When you get to share with someone and study the Word of God, seeing the light bulb go on and the spark in their eyes is such an encouragement – God is so faithful to show up when you really seek him with all of your heart, soul and mind! 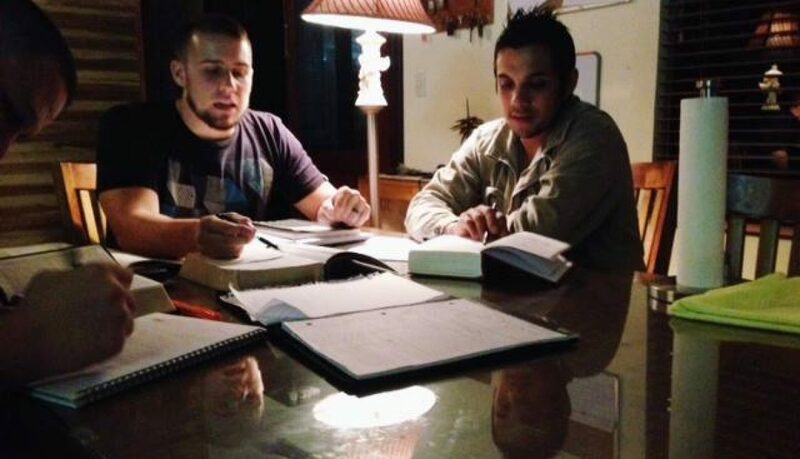 Tyler meets with young men and young adults on a regular basis to study and pray – some join us for bible study, but several of them prefer the one on one time to freely ask questions and study individually on an even more personal level. Our hope and prayer is that they will take what they learn and continue to move on following the Lord with all of their hearts! The seeds have definitely been planted and watered! After a great summer of discipleship training and serving together, we had a beautiful and special time together with the interns as we sent them off to what God had next for each one of them. Farming isn’t for the weak! A day with the interns on the farm caring for the cattle, pigs, and yuca wasn’t all hot and dirty! As I sit on the patio of the new mission house of Relentless Ministries I cannot help but simply marvel at the grace and glory of our God. It is absolutely incredible how, in His sovereignty, He has “moved mountains” and ordained our steps, making clear His path in regards to this ministry. I am now seeing more clearly that the mountain tops in our lives would lose their magnificence and splendor if not for the contrast of the deep valleys. This is definitely a mountain top time and God’s glory and majesty is so vivid. It is incredible to think that only 8 months ago this ministry was only a dream, an idea to trust God to take people who are not wise in the world’s eyes and use them to accomplish His purposes for His glory. In January we had no idea where, when or how this mission and discipleship program would come to be, but in faith we stepped out and prayed and asked God to give us faith that provokes His faithfulness. Thank you, God bless you and may He be glorified through His work here in Costa Rica!